How Much Will a Trip to Spain Cost? Well-known for its sunshine, tapas, siestas, and fantastic wine, Spain has always been a popular holiday destination. Boasting the second-highest amount of international visitors in the world in 2017, travelling to Spain is only growing in popularity. However, with all these people wanting to experience the Spanish sun and laid-back lifestyle for themselves, you are sure to beg the question: How much will a trip to Spain cost? After spending many months travelling and living in Spain and keeping a keen eye on our expenses, we’ve narrowed the five biggest areas that are going to factor into an overall Spain trip cost: accommodation, transportation, food, activities, and entertainment. If you are smart about where and how you spend your money in these areas, you will find that a trip to Spain doesn’t have to cost much at all. The first biggest area that you’re going to need to consider when planning for your overall trip to Spain cost is going to be accommodation. This is likely going to take one of the biggest percentages out of your Spanish travel budget and it is important to get an idea of the average costs and types of accommodation available in Spain before you get too far into planning your trip. There are a multitude of accommodation choices throughout Spain and they all come with radically different price tags. 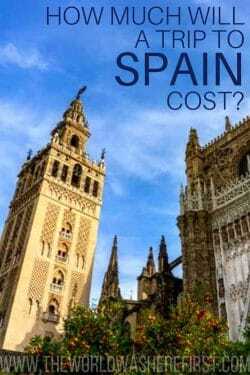 In fact, it is very much in this category where your overall Spain trip cost could skyrocket. Luxury hotels abound in this Southern European nation, especially in cities like Madrid, Barcelona, Seville, Málaga, and along the Costa del Sol and these can come with an incredibly steep price tag. However, while high-end accommodation certainly isn’t hard to come by in Spain, the same goes for more budget-friendly options. Keeping in mind that the big cities and popular tourist areas tend to be more expensive than smaller, more off-beat towns, there are still myriad affordable options available for the more budget-conscious traveller. For instance, if your travel budget falls more into the mid-range category, you can expect a double room in a budget- to mid-range hotel to land somewhere around €50-100 per night. Obviously, prices will vary depending on factors like location, amenities, etc, however, this is a good average to go off on. If you’re truly travelling on a budget or backpacking through Spain, then hostels are likely going to be your best option. Luckily, Spain has well-cemented itself on the backpacker trail and there are usually numerous hostels to choose from in most major cities. Even smaller, lesser-visited cities in Spain usually have one or two. While the average cost of a dorm bed in Spain isn’t as cheap as you’ll find in Central or Eastern Europe, you can still expect them to be an affordable place to spend the night, especially if you’re travelling solo. Depending where you find yourself, you can expect a bed in a hostel dorm to start somewhere around €15-20 per night. If the traditional accommodation options seem like they might be a little too expensive for you, there is still good news. Airbnb is an excellent option to save money on accommodation costs in Spain. While there are certainly some cities in Spain (Barcelona springs to mind) where the ethics of using Airbnb to travel are called to question, there are ways to use the platform responsibly without having a negative effect on the locals. For instance, finding a private room on Airbnb where you are sharing the house with a local is an excellent way to cut down on your trip to Spain cost without taking away affordable housing from those who actually live in the city. It is also a particularly attractive way to save money if you’re travelling as a couple. On average, you can expect a private room on Airbnb in a major city to cost around €40 per night and expect to pay about €30-35 per night in smaller cities and towns. If you’re new to Airbnb, you can click here to get up to $40 off your first stay! All in, whether you’re travelling solo or as a couple, it isn’t entirely necessary to spend more than €20 per person per night on accommodation in Spain. Now that we’ve covered the cost of accommodation, it is time to get into the price of another major category in your Spanish travel budget: transportation. You’re going to need to get around the country and the cities you’re visiting somehow and, unfortunately, it is going to cost you. There are two different areas you need to factor in when you’re considering how much to budget for transport costs in Spain: intercity transport (ie. long distance coaches and train) and city public transport (ie. metros, trams, and buses). I’m going to cover intercity transport first. If you want to cut down on your total Spain trip cost, then I am going to give you one major piece of advice: don’t take the train. Before visiting this wonderful country when I was in the research stage, I was astounded by how many travel blogs and forums acted as if the only form of transport between cities in Spain was the train, and I was even more astounded when I realised how expensive fares were. Sure, you can save money on train tickets in Spain if you book months in advance and they are fast and comfortable, however, if you want to be a little bit flexible with your itinerary or are trying to save as much money as you can, then the train is just not an affordable option. A far better and more budget-friendly option would be to use the extensive intercity bus system. The system is just as vast as the train system (sometimes even more so, the train can’t go everywhere!) and tickets can be more than 50% less expensive than the train. For instance, if you’re looking to get between two major cities in Spain by bus, expect to pay about €15-20 for a one-way ticket. Obviously, this depends on the length of the journey, however, it is a good average. Another even more affordable option for travelling throughout Spain would be to use BlaBlaCar. This is a ridesharing service that connects travellers with locals with a car who are driving to the same location. It operates much in the same way that Airbnb does, except with carpooling, not home rentals, and is the most budget-friendly way to get around the country save for hitchhiking. Another popular mode of transport in Spain is to rent a car, especially for those who want to get out of the bigger cities or are keen to explore the Costa del Sol. Surprisingly, if you know where to looks, daily rental car rates can actually be quite low, especially if you get third-party insurance (we recommend iCarHireInsurance for affordable excess insurance!) and are comfortable driving a manual transmission. If you’re on a tight budget, it is possible to rent a car in Spain for around €20 per day, however, this is not factoring in fuel prices, which can be quite high (around €1.30 per litre). If you want to find the best deals for renting a car, we recommend using RentalCars.com. It is also worth knowing that, if you’re from outside the EU, the Spanish government requires you to obtain an International Driver’s Permit. If you’re caught driving on a non-EU licence without one, your car could be towed and you will face a hefty fine that will certainly add to your trip to Spain cost. Now that we’ve covered the cost of intercity transport, let’s talk about how much it will cost get around the amazing Spanish cities that you’ll be visiting! 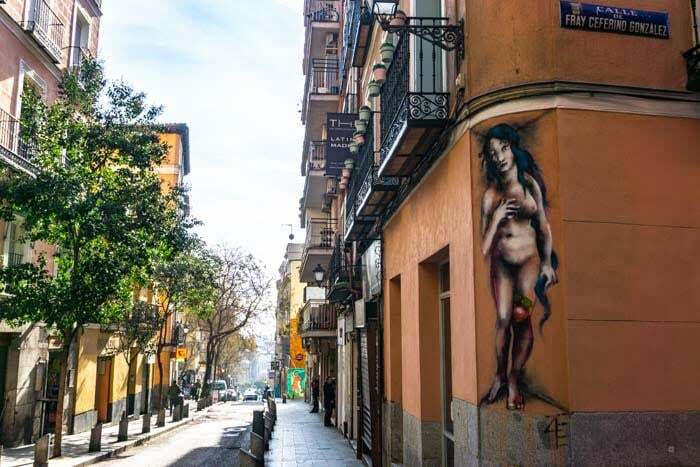 Luckily for the budget-conscious traveller, most Spanish cities are gloriously walkable and you can easily get around to most of the main tourist sites on foot. However, sometimes, you need to use public transport to get from point A to point B when the distances are just too far to walk. Spanish cities are well-served by affordable public transport including both bus and metro systems. If you plan to stay in any city for longer than a few days and expect to use the transport system a lot, it can be worth purchasing a travel card as it will inevitably cost you less per journey than buying single tickets. However, if you don’t plan on using the transport system much, then purchasing single tickets is going to be a better bet. Most bus and metro tickets cost between €1.30-1.50 for a single journey. All in all, if don’t rent a car, only plan to travel between cities only every three or four days or so and walk most places instead of relying on the bus, metro, or uber/taxis, then expect to spend an average of about €8-10 per day on transportation. It is easy to get around Spanish cities, like Málaga, on foot! Now that we’ve covered boring costs of Spain travel like accommodation and transport, now it’s time to talk about one of the main reasons you’re visiting Spain anyway: the food. Spanish cuisine has reached a pique in its popularity with many people visiting the country solely to experience its unique tapas culture and balanced Mediterranean diet. And no trip to Spain is complete without taking full advantage of the many gastronomic opportunities available. And luckily, if you know where to go, eating out in Spain does not have to be expensive at all. Sure, if you plan to eat out every single meal and only frequent restaurants directly catered toward tourists, then it won’t be hard to spend the majority of your Spain budget on food. However, if you are frugal and smart about when you eat out in a restaurant, you don’t need to spend much money at all. Overall, I would suggest only planning on eating one meal out per day. Breakfast isn’t a huge ordeal in Spain so it is easy to skip going out for your first meal of the day while you’re in the country. Also, if you happen to be staying in accommodation that provides free breakfast, that will save you some money anyway. Otherwise, we recommend finding a place to stay that offers at least some self catering facilities so you can make your own breakfast for yourself. This will save you lots of money because groceries in Spain can be very affordable. If you do eat one meal out per day, I would advise that meal to be lunch. Lunch is often the biggest, most heavy meal in Spanish culture and it is possible to get an incredibly hearty and large meal at lunchtime for a great value. One of the best budget tips I could give when trying to figure out your Spain trip cost is to take advantage of the prevalent menú del día deals that are available throughout the country. Basically, a menú del día (literally menu of the day) is a daily set lunch menu that will typically include a beverage (a glass of wine, beer, or a soft drink), an entree, a main dish, and a dessert or coffee all for a low price. There is generally a lot of food in these set menus and it is an excellent way to get a hearty Spanish meal without breaking the bank. They are available at most restaurants, however, the restaurants catered toward tourists tend to be a bit more pricey. Generally, I wouldn’t recommend spending more than about €10-12 on a menú del día, even in cities like Madrid or Seville. Now it’s time to get onto the price of one of Spain’s most popular food traditions: tapas! Tapas are a wonderful way to go out, have a drink, and sample some of the countries top specialities without getting too much food. They are also typically affordable. In some cities, you might even get a free tapa with the order of a drink. This is common in most bars in cities like Granada but also more locals restaurants in Madrid, as well. However, many places you will have to pay for tapas. Depending on what you order, tapas will set you back around €2-4. They are quite small and you will need to order 3 or 4 different plates in order to have a full meal in most cases. Therefore, a light meal with some tapas and a drink will rarely cost you more than about €10-15 per person. This is, of course, you decide to head to a restaurant or bar that is more catered toward locals rather than tourists where prices are less likely to be inflated. All in, if plan to budget about €15 per person per day for food in Spain, you are sure to eat very well! Delicious Spanish food doesn’t have to break the bank! Now that we’ve covered the basic costs of food, accommodation, and transportation in Spain, we need to discuss how much it will cost you to actually do things in this beautiful country. Spain is packed with amazing historical monuments, fascinating museums, and wonderful natural sites that it can seem overwhelming to choose what to see and do when you’re visiting. However, heading to many of these attractions tend to cost money and it is a major factor to consider when figuring out how much a trip to Spain will cost. In Spain, most museums will charge an entry fee. While the fee will vary from museum to museum, you can expect to pay for entry for most of them. Madrid’s ever-popular Prado Museum, for instance, charges €15 for entry. Conversely, the underrated Museo del Vino in Málaga, where you get two glasses of wine along with entry to the museum, is €5. One way to save money on museum visits in Spain is to check to see if there are any free entry time periods. Many of the most prominent museums open their doors for free for a few hours each day or one day per week. Make sure to check the specific museum’s website to see if there are any times where you can get in for free. Another popular activity in Spain is to visit the many cathedrals and historic sites that are all over the country. Normally, you will have to pay an entry fee for these as well. The fee usually depends on how popular the site is and how much work needs to be done to preserve the site. For instance, entry into Granada’s famed Alhambra costs €14 without a guided tour, however, this is on the high-end for historical site entry. Another popular activity in Spain would be to go to a flamenco show. Now, there is a massive discrepancy between costs for flamenco shows and a lot of it really depends on where and when you decide to see this most Spanish of performances. If you head to a massive, touristy flamenco show in Madrid, for instance, you can sometimes end up paying up to €50 for the pleasure of attending. However, if you find yourself in cities like Seville or Jerez (the region where the art actually got its start), it is possible to see authentic flamenco in a bar just for the price of a drink. However, if you want to head to an authentic “flamenco show” that is more geared toward tourists, an agreeable price to pay for this would be around €20-25. All in, if you only choose to do one paid activity per day (and opt to forgo them entirely some days), expect to pay about €10 per day on this. Now that we’ve covered the costs of accommodation, transport, food, and activities in Spain, we have reached our final category: entertainment. How much you tend to spend on entertainment truly depends on you general habits, however, you don’t need to spend a lot in Spain to have a good time. If you like to go out in the evening and have a good time, then Spain is the country for you. Famous for it’s late-night culture, going out in Spain is common and relatively affordable, especially compared with prices found in Northern Europe or the USA. For instance, a glass of house wine at a bar in Spain is likely only going to set you back around €2-2.50 and a small draft beer (colloquially referred to as a caña in Spain) is normally only about €1.50. Often times, as well, you will get a small dish of olives or some other snack with your drinks. In cities like Granada, it is also common to get a free tapa (which is more than a dish of olives) with the order of a drink, however, drinks can be slightly more expensive to make up for the free food. However, it isn’t normally anything significant, as a caña will still only set you back about €2 and you’ll get a sizeable snack with it as well! Liquor and hard alcohol are likely going to cost more, with a basic cocktail like a gin & tonic or a negroni will cost somewhere between €4-6 depending on where it is you’re drinking. All in, if you drink responsibly and don’t plan to spend most of your nights in Spain out on the town, you don’t need to budget more than about €5 per day on entertainment in Spain. A drink like wine, beer, or vermouth, doesn’t have to be expensive in Spain! With all the above factors considered, this is the average amount you should expect to spend in Spain per person per day. Providing that you only travel between cities every three or four days, cook some daily meals at your accommodation, and don’t spend a lot of money of expensive tours or activities, you can expect your average trip to Spain cost to be around €50-60 per day. This doesn’t include any pre-trip expenses such as flights or travel insurance. We personally used World Nomads for travel insurance during our time in Spain to ensure we’re covered for any unfortunate events. Click here to get a quote from World Nomads. The Castillo de San Sebastian in Cádiz — an affordbale Spanish city to visit! Travelling in Spain doesn’t have to be too expensive. While it isn’t the cheapest country to visit in Europe for Western travellers, it is still an affordable destination with lots of ways to save money. Are you trying to figure out an average trip to Spain cost? Have you been? Let us know in the comments!